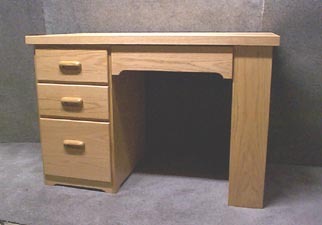 Free Beckys Desk plans - A New England Wood worker shares free woodworking plans and tips with amateur woodworkers. Huge resource of wood working plans and services for wood workers. Hi all, just a couple of pics of the desk in process. This is the left hand side of the desk, (yer knees would go to the left of this unit) The back is 3/4" oak veneer ply (with the osb core) and the rest is solid oak. The finish is 3 coats of semi-gloss poly.